Do you ever watch professional tango dancers and wonder how they manage to have such grace and beautiful lines? Not only did they study and practice Tango for many years, but most likely they also had some classical ballet training. Ballet truly is the foundation of all dances (okay, well maybe not hip hop or krumping, but you know what I mean). It is one of the most challenging dances to master but everyone can benefit from learning ballet’s basic elements. This is why I was thrilled to learn that one of our local Tangueras is also a semi-professional ballerina who teaches a Ballet for adults class at Studio 1924. I was so excited to meet her, I immediately asked if she would agree to an interview for SF Loves Tango. Lucky for all of us, she did agree. 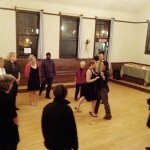 You all may know Stephanie Berg as the dance partner of our local Tango instructor, Nicholas Tapia. They made it to the FINALS, placing 5th, in the 2013 USA Tango Championships here in San Francisco. Stephanie is quite amazing as she has been dancing since she was 3 and not only dances Argentine Tango and Ballet, but also Salsa, West Coast Swing, West African Dance, Hip-Hop, Jazz and Modern and is also a formally trained Ballroom dance instructor. 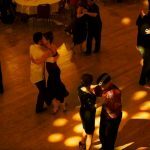 And, since Stephanie dances Tango regularly, she can help Tango dancers in her class with what they need to DANCE TANGO BETTER. 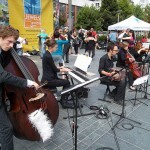 SF Loves Tango: At what age did you start dancing and why? SB: I started dancing at 3, doing Ballet at my local community center. From an early age I was lucky enough to be on stage with professional dancers and full scale productions. From there I did other types of dance including: jazz, hip-hop, contemporary and West African, although I always focused on classical ballet. Being a dancer was and still is a huge part of my identity. So for me it isn’t a question of ‘why I dance’, it is ‘of course I have dance’. I have been fortunate enough to have done so my whole life. 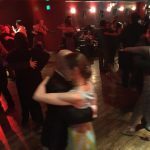 SF Loves Tango: Why did you decide to start teaching Ballet at Studio 1924? SB: I decided to teach Ballet at Studio 1924 because it fulfills several of my main goals as a teacher: getting my students strong, preventing injuries and creating a high level of body awareness. Ballet is sneaky in accomplishing these tasks. It is one of the most physically challenging dances I know and yet it looks effortless. It teaches fundamental posture, body alignment and builds strength evenly across the body. I find that Ballet is especially applicable to followers in Ballroom and Tango because women are in heels, which requires strength especially in the feet, ankles, and core. Without training in how to protect the ankles and knees from injury, dancing in heels can affect the whole body for the worse. Ballet and exercises help prevent this. Leaders too can benefit from ballet. It helps to create strength in the legs and core, as well as improving stability and balance. 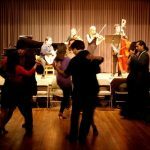 SF Loves Tango: Do you teach dance anywhere else? SB: I am lucky enough to teach at several studios in the East Bay. The best way to catch one of my classes is to check out my calendar online. 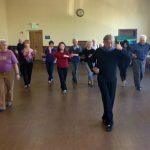 I teach at Just Dance in Oakland, The Lake Merritt Dance Center for their Birthday Dances, and I assist Jeff Chandler at Allegro with his Bronze 1,2 & Pre-Silver Ballroom classes once a week. 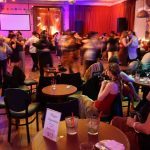 I also work with Nicholas and the UC Berkeley Tango club on Thursdays and we teach together at La Casa Grande (a new Tango class) on Wednesdays. I am hoping to add a new group class soon, Ballet for Tango Dancers (follower focused but leaders welcome) a class that will strengthen Tango dancers using exercises from Ballet. I also offer private lessons in any of the dances I teach. Honestly, I had been training so much recently that I had not been as focused on teaching. I really wanted to center my attention on my own dancing and journey so that I could efficiently and smoothly help others as they learn. However, now I am focusing on teaching after this period of growth! 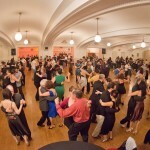 SF Loves Tango: What do you focus on in the Ballet classes? Do people need any dance experience to take the class? SB: Students do not need any dance experience to take my ballet class. I try to start at the beginning with everyone. I go over the positions, the terms I use in class and the basic body motions we use in ballet. I try to highlight proper alignment of the body to avoid injury and use muscles efficiently. Ballet can be difficult because it requires different strength from the usual motions of everyday life. However, the progress can be seen quickly and the body can transform at any age and from any level of fitness. 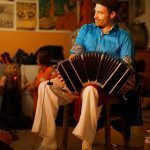 SF Loves Tango: What should people wear to the class? SB: I am pretty relaxed about dress. You will need to see your legs, and core the most. Yoga clothes are great, ballet clothes are best. Having socks or bare feet are ok for the first few classes, but eventually you will need ballet slippers which you can get at a dance store for about $25. Hair should be up and off the neck for ladies (or gents with long hair). I also include a packet for new dancers that will give them a vocabulary list, general notes and pictures of positions. It may sound like a lot, but I am there to guide and help students every step of the way and the progress is so worth it!